John Marshall High School seniors Audrey Gray and Kameron Prager have been selected the Career & Technical Education Students of the Month for October. From left: Family & Consumer Science teacher Katie Williams and Audrey Gray. Audrey is the Family, Career and Community Leaders of America (FCCLA) President, ProStart Front of the House Manager and a member of the National Technical Honor Society. She is also a member of the Drug Free Club and Blood Drive Club as well as being a Freshmen Mentor. 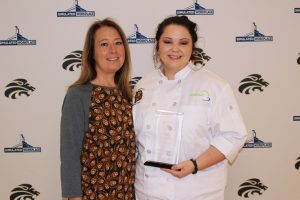 Audrey plans to attend West Virginia Northern Community College to major in Culinary Arts. She is the daughter of Zande and Melissa Gray. 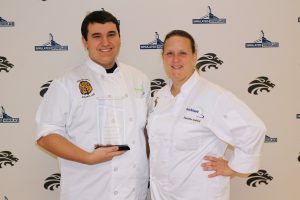 From left: Kameron Prager and PROSTART teacher Susanne Cubic. Kameron is involved with Monarch Café, the school’s restaurant. He hopes to someday own an eatery of his own. Kameron is the son of William Prager.